How was everybody’s weekend?! Mine was great. You know why? Because I had no plans! Gasp! I can’t even remember the last time that has happened. Since I work on the weekends on a regular basis, it leaves fewer free weekends — meaning those free weekends fill up quickly with trips and events. Don’t get me wrong, they’re all super fun things, but once in awhile it’s nice to just be free (maybe a little too dramatic?). Not only was it a free weekend, but it was a free weekend with Philip. It had been a few weekends too many since it was just us…with no agenda but to stay warm. Because I was so giddy about this weekend, I even made a last minute decision on Saturday to call and cancel my eye appointment. It was a big deal for me (Philip can attest to this). I don’t just cancel an appointment for no reason other than I want to have a day with no interruptions. I felt like such a rebel. Yes, I realize that’s pretty pathetic. But you know what? It was the best decision I could have made. Philip and I had such a fun Saturday and we didn’t look at the clock once all afternoon. 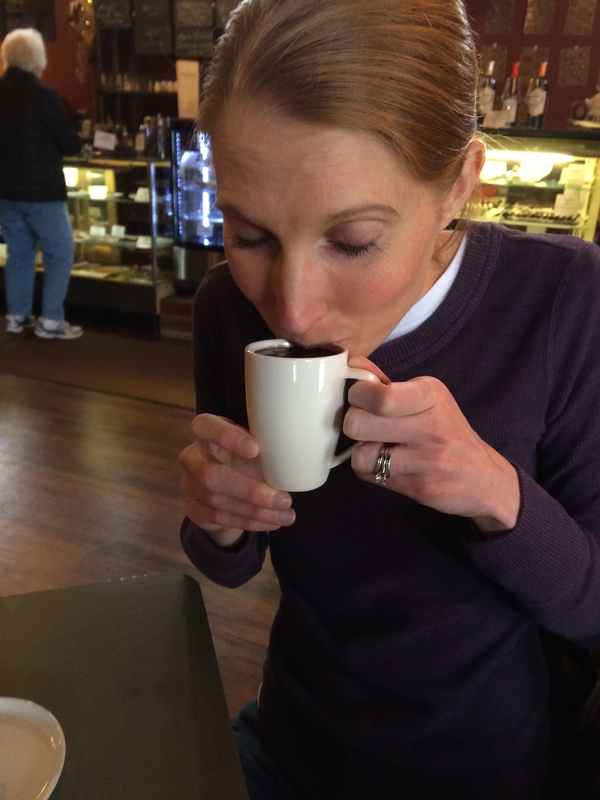 To make our day even sweeter (pun intended), we hit up some pretty, darn good chocolate shops in the area that I had been wanting to try out. We had lunch at Chocolaterian Cafe (you know a cafe is good when there’s chocolate in the name) and enjoyed some very rich and wonderful hot chocolate. 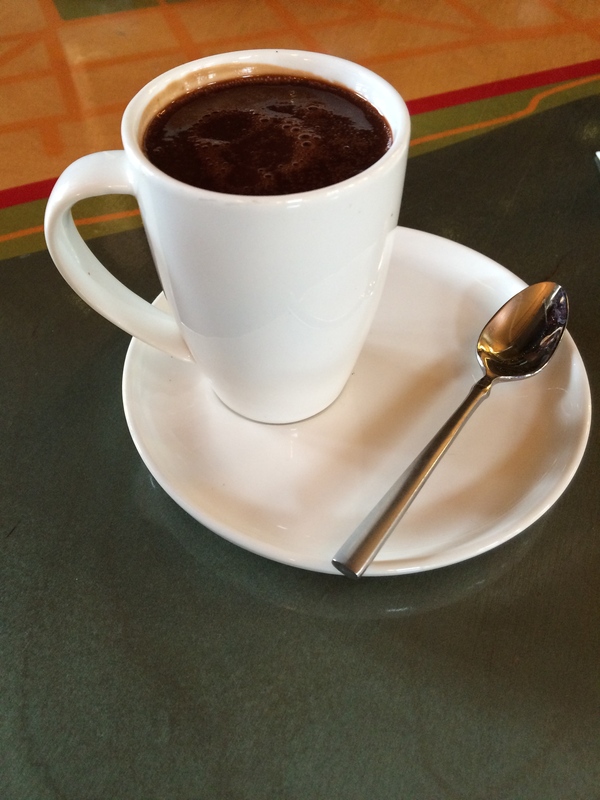 …is really a dainty 4-ounce mug filled to the brim with Parisian hot chocolate — “sipping hot chocolate” — that is literally like drinking thick, velvety and smooth chocolate. It was so thick it started to form a skin on top as it cooled. Heavenly. 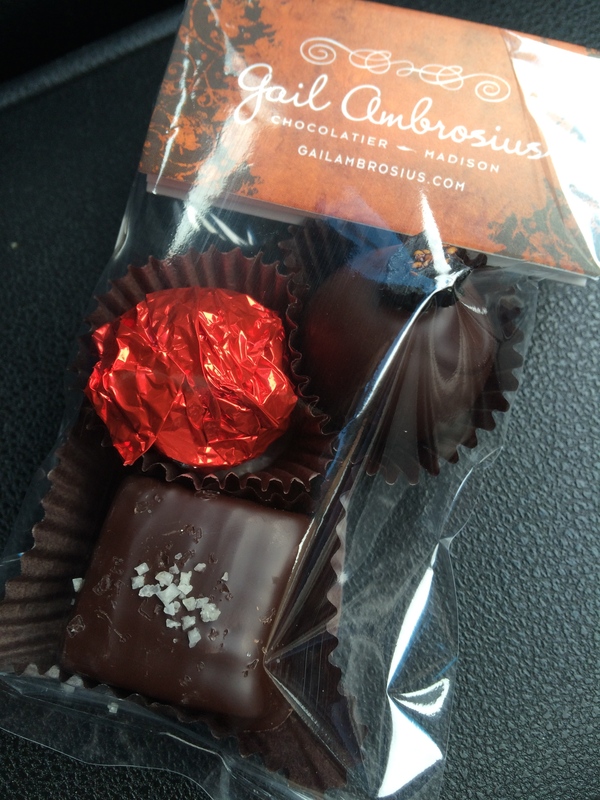 And because we could, we walked a couple blocks down to Gail Ambrosius Chocolatier. Gail’s shop was just as cute. It’s a tiny shop filled with quality handmade chocolates. As soon as we walked in, we were hit with the smell of fine chocolate. Seriously, does it get any better? We picked out a couple truffles (Cinnamon Cayenne for him and Fig for her) and a salted caramel to share and saved them for later. So good! I mean, how can you have a bad weekend when it involves so much chocolate goodness? Even if your weekend didn’t involve quite as much decadence as ours did, at least you can start off the week with something almost as good (err…at least just as warm and comforting) with my Cheesy Sausage Quiche. Okay, you’re right, it’s not Parisian hot chocolate, but it is perfect for this cold weather we’ve been hit with. It comes together so quickly and warms you right up on a chilly weekday night. I never thought I liked quiches all that much until I tried this Wild Rice Quiche at my aunt and uncle’s, which is still my all-time favorite quiche. 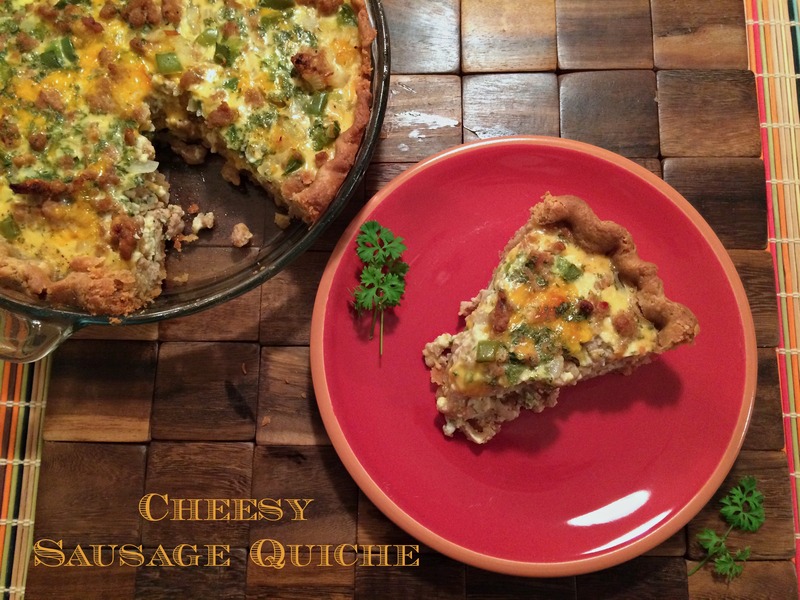 This Cheesy Sausage Quiche was another recipe passed along to me by them. 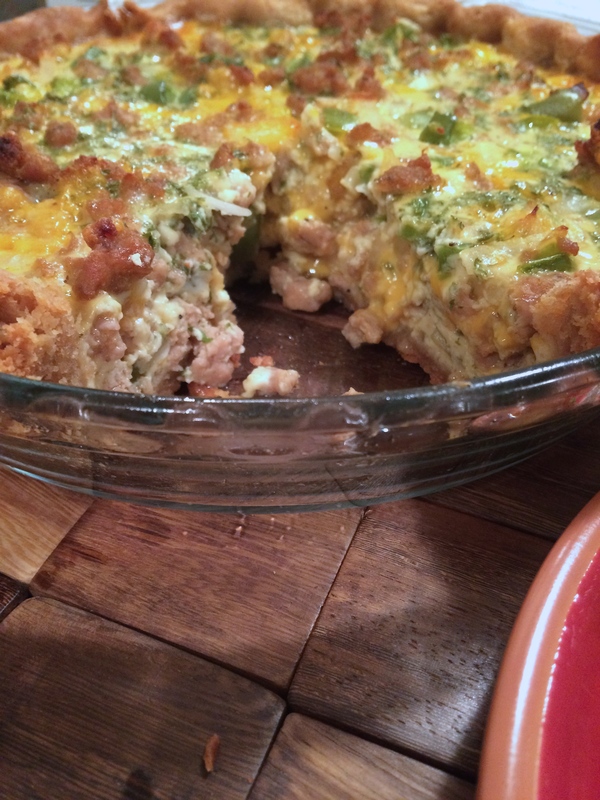 They never disappoint me with their recipes and this quiche was no exception. 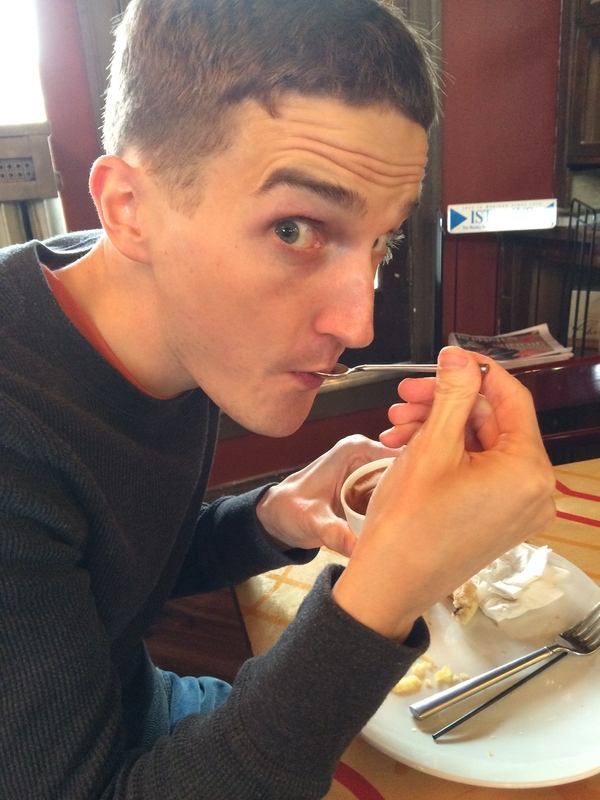 Philip and I were savoring every bite. 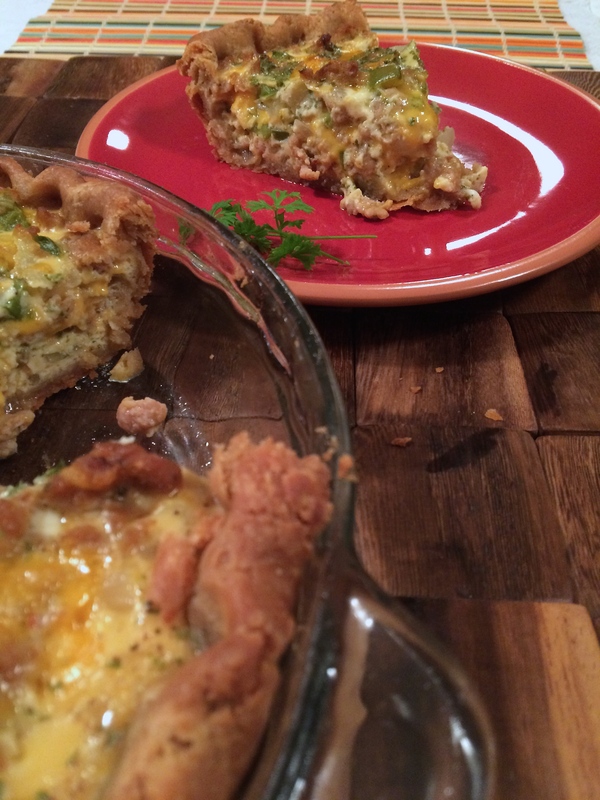 I think I have the quiche-bug…if there is such a thing. After eating this quiche, Philip and I (but mostly me) couldn’t stop trying to think up different combinations of ingredients to go into quiches. 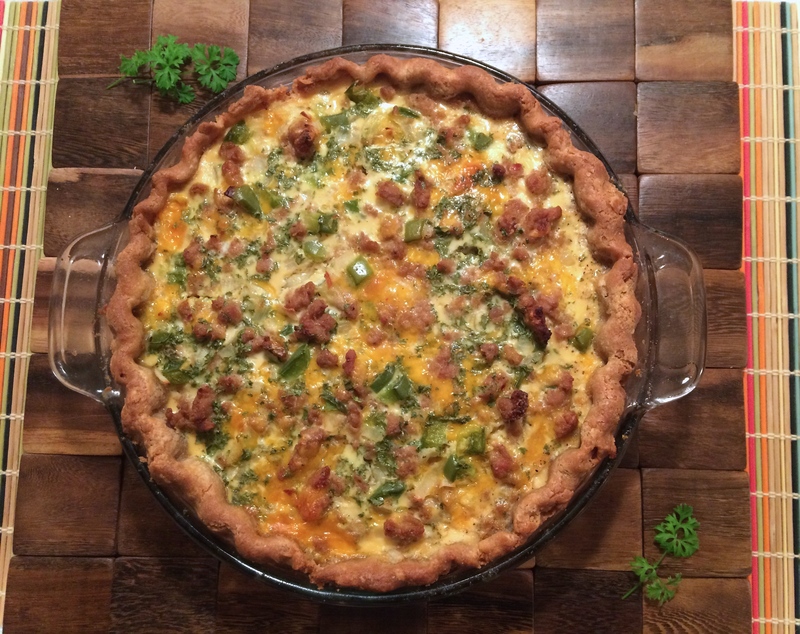 Just the other day after leaving the gym together, I piped up with, “You know, I could make a quiche using…” But then again, you may have seen that I think about some pretty random things while running, so this shouldn’t be too surprising, I guess. Anyway, I think the appeal to quiches is that they’re hearty, comforting, budget-friendly, and a cinch to put together. It’s especially nice for a weeknight meal when I have pie dough in the freezer just waiting for me to thaw out, like I did for this quiche. You wouldn’t have to make your own crust, of course. Store bought would do the trick. 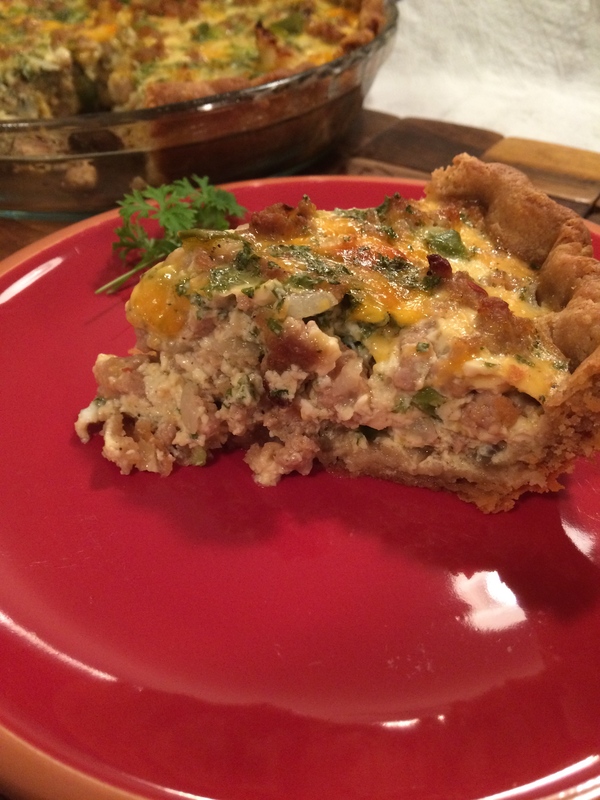 To up the nutritional value of this quiche a bit, I made a few changes from the original recipe like cutting down the salt and using turkey sausage, which goes unnoticed among all the other ingredients in the quiche. Heat skillet on medium heat. Add turkey sausage, onion, and green pepper and cook until turkey sausage is cooked through and no longer pink. Drain and rinse the sausage mixture and return to the skillet. Add flour and cheese to sausage mixture and mix well (the cheese will not completely melt into the sausage and may be slightly clumpy). Spoon sausage mixture into the pie shell and spread evenly. Combine the eggs, garlic powder, milk, parsley, and pepper together. Pour egg mixture over the sausage mixture. 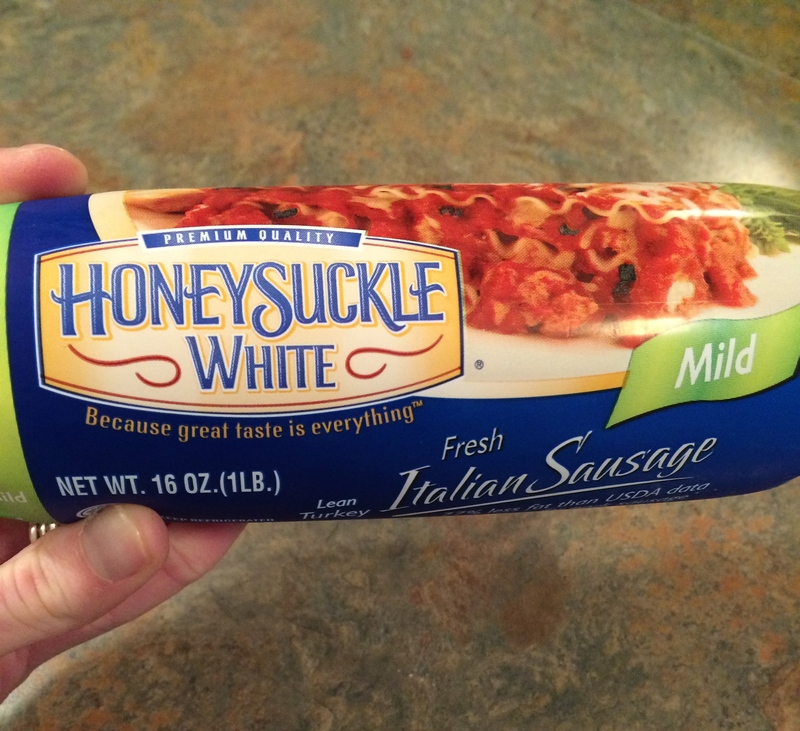 The liquid may not completely cover the sausage mixture. Bake at 350° for 40–60 minutes or until knife inserted in the center comes out clean. Always love the recipes you posted! I’m so glad you’re liking them, Kai Ling! Miss you!